Yesterday I put together a little veg box to say thank you to my doctor who had helped me out the day before. 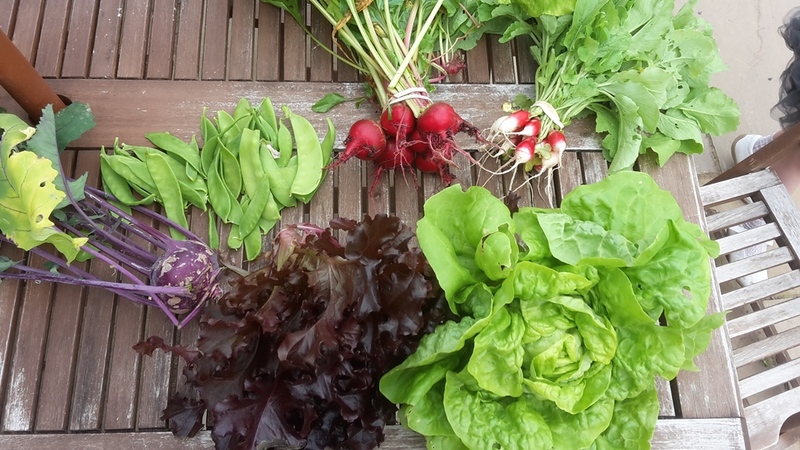 Producing veg boxes is something I'm seriously considering to do next year at the moment, along with eggs I could also add at the moment kale, golden beets, bunched herbs, bag of mizzuna leaves, Paris market carrots, green garlic and broad beans. Does anyone reading this receive a veg box? How many items do you get and what do you pay (if you don't mind me asking)? Do you sign up for the year or on a week by week basis? What a lovely gift. I sell our eggs and plan on putting a few things in with them for sale if I get a glut; I sold a couple of tomato plants a few weeks ago. We receive a weekly organic vegetable box containing ten items, for which we pay £14 including delivery from a local grower. I think you're talking about what we call a CSA here (community supported agriculture) which is paid in a lump sum in the spring. We shared one with another couple when we were renting. I honestly can't remember the weekly cost but it was very reasonable. The farm was amish and we would get eggs, honey in addition to veg. If veg was short that week we would also get homemade bread or candies (in the early winter). We loved it. There was a man around here selling vegetable boxes at the farmers market and he did very well. You would put a deposit on the wicker basket and get an assortment of veg for one money. I am seriously considering going this route if i sell next year. i sign up for a CSA (community sustained agriculture)box for fall/winter/spring. i get cheese and eggs and honey and things like apple butter and maple syrup depending on what time of year it is. i pay different price depending on the season. 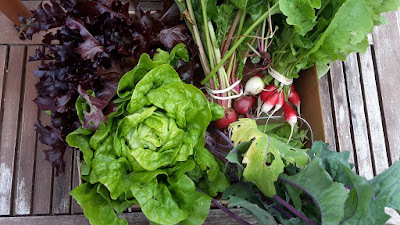 i love it because i get fresh greens raised in hoop houses in winter. all of this along with lots of vegetables and occasionally fruit. i get a box every 2 weeks and i think it averages about 45.00 per month. i love my csa boxes. Hi Kev :) That's a wonderful gift to receive! We have CSA services here too, but they are so expensive. I wanted to try one out for a while to see how creative I could get with the seasonal produce (no eggs in our boxes), but we'd have to drive out a half an hour to pick them up and with the expensive cost of the box itself and gas expense...I'm much better off doing my own shopping at our market. It's too bad because I'd love to have that delivered directly to my door! That was a very thoughtful gift for the helpful doctor. Having an allotment I have no personal experience of veg boxes, but friends who have had them only really wanted the usual veg (carrots etc) & eventually dropped out of the schemes because of not wanting to regularly use the less usual veg supplied (fennel, kohl rabi etc). I suspect you need to know your local customers' requirements really well to make the scheme work without too much waste. Good luck if you decide to have a go - it's a great idea. As a child I was chased by a dog and threw a handful of wild flowers at it to chase it away. The wind blew the seeds back into my face and the result was blinding for hours. Turns out the seeds were from common groundsel which was once used as medicine for drawing out infection in the eye. Good to teach your children about wild plants and their uses and dangers. We get a co=op bag (recyclable) once a week here which is specifically for low income peps like us. It is seasonal and costs $6 pre-paid weekly at pick up. This week (winter here) we got two carrots, an onion, a cauliflower, quarter of a cabbage, two apples and two bananas. We can also buy from the extras table when we pick up. This has been a godsend for us and most of the produce is local which is why it is cheap as the co-op buys from the wholesalers direct. Not very useful for you really although we do get some surplus from local gardens in season if we are lucky.